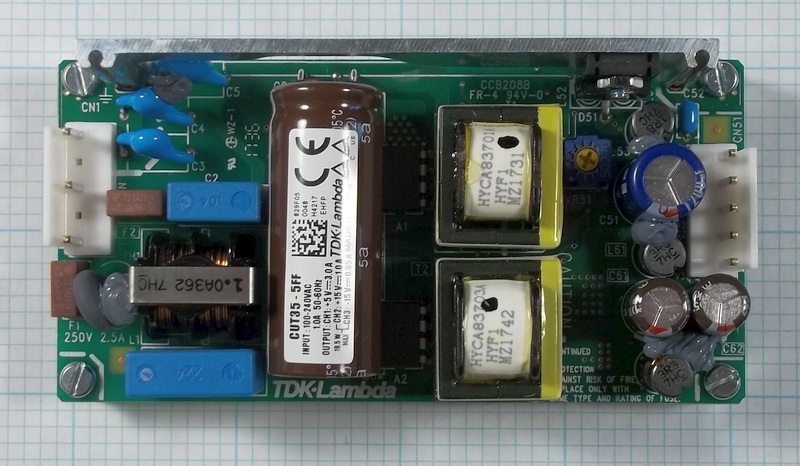 I had a chance to test the TDK-Lambda 35W 5V 3A, +/-15V 650 mA switching supply. The CUT35 is a mixture of TH and SMT. The 8 pin DIP switcher ICs appear to be a Lambda proprietary part. Note that there are dangerous potentially lethal line voltages on the primary side of this supply. Use caution when handling and bench-testing. The CUT35-5FF is small measuring about 2" by 4". One unique feature is that the bipolar output and 5V output are isolated and do not share a common ground. The unloaded outputs measure almost exactly on-target. 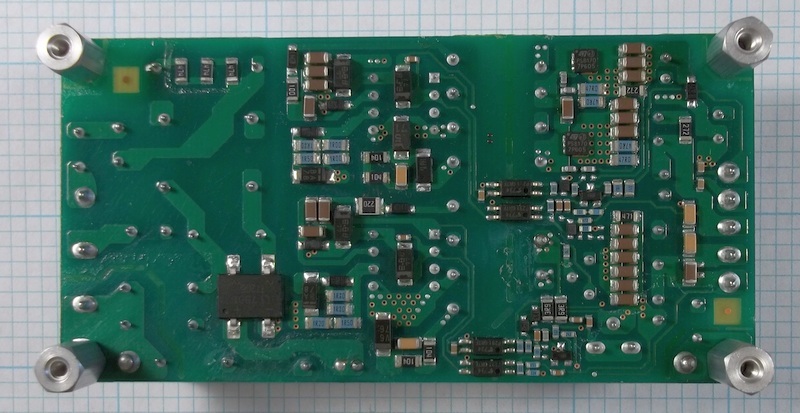 A minimum load is not required for start-up but it was found that a +/-15V (30V) pre-load current of 15 mA was required for low-noise operation. If the CUT35 is started without pre-load and the load then added it remains somewhat noisy with sawtooth ripple in the 10s of millivolts. With the 15 mA pre-load applied at startup, ripple and noise is exceptionally low <4mV P-P measured on the scope. With a board connected having a 50 mA load I saw no issues with noise. The CUT35 appears to have two separate converters one for the 5V the second for the bipolar 15V. It also has two transformers. The bipolar supply uses a center-tapped transformer with half-wave rectification. The 5V supply uses a single output winding and a dual diode half-wave rectifier connected in parallel. There are 4 opto-isolators which cross the galvanic barrier. The 5V may have one for voltage feedback and the second to detect over-current. The second pair of optos, on the bipolar supply, along with a second convertor IC suggest voltage feedback for at least one of the channels if not both. I measured the noise floor of the MS-II connected to the TDK CUT35-5FF and it was as quiet as when powered from the linear bench supply. I needed to run a Phono Transfer System on overnight burn in and do final QC so I used the TDK CUT35-5FF. I couldn't distinguish any difference in noise floor between running the low-level preamp on the TDK switcher and a linear bench supply. The TDK CUT35-5FF triple-output bipolar supply rocks! I think its my "goto" switcher. To bad they don't make it in a desktop.